For the first time, we have developed a protocol for rapid and successful induction of haploids in Tagetes spp. using in vitro androgenesis techniques. Various factors affecting the in vitro androgenesis response in Tagetes spp. were optimised. At first, a correlation was established between floret size/bud size and stage of microspore development in different genotypes of Tagetes erecta and Tagetes patula. The floret size of 3.5–4.0 mm (French marigold) and 3.0–3.5 mm (African marigold) contained the highest percent of microspores at early-uninucleate to early-binucleate stage. The frequency of shoot formation from anthers ranged from 0 to 78.6% in T. patula cv. Pusa Arpita and 0 to 63.9% in T. erecta cv. Pusa Basanti Gainda. The French marigold cultivars exhibited higher androgenic response over the African marigold cultivars. 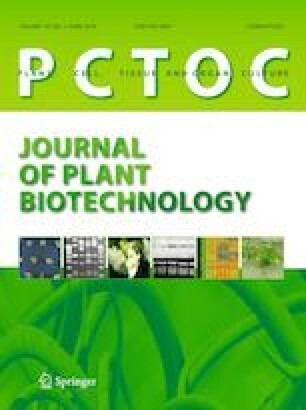 The effects of basal media, plant growth regulator combinations and sucrose concentration for direct differentiation of shoot buds and haploid induction were studied. Marigold anthers cultured on newly formulated EMS1 basal media (enriched with coconut water, AgNO3, PVP etc.) exhibited a very high androgenic response over the other commercially available media. We have also optimised the cold temperature pre-treatments and culture condition for high frequency androgenesis in marigold. Ten days cold pre-treated anthers along with 20 days dark incubation of cultures proved highly beneficial for haploid induction. Among a total of 424 anther-regenerants, 56 plants were randomly selected for flow cytometry and cytological analysis. The ploidy analysis revealed 14.3% of anther regenerants as dihaploids, 66.1% as tetraploid (similar to donor mother plant) and 19.6% as polyploid. The determination of ploidy level by counting the number of chloroplast in stomatal guard cells of marigold was also established for rapid screening of haploids. The identified haploids were successfully diploidised and are being utilised in the hybrid breeding programme at our institute. The developed protocol will facilitate doubled haploids based breeding in Tagetes spp. This is the first report of successful induction of haploids in Tagetes spp. using in vitro androgenesis techniques. We have studied various factors affecting the in vitro androgenesis response in Tagetes spp. A correlation was established between floret size/ bud size and stage of microspore development in different genotypes of Tagetes erecta and Tagetes patula. Basal media and cultural conditions were optimised for high frequency androgenesis in marigold. Haploids were successfully induced and their ploidy level was assessed through flowcytometry and cytological analysis. The online version of this article ( https://doi.org/10.1007/s11240-019-01598-3) contains supplementary material, which is available to authorized users. Authors sincerely acknowledge the ICAR-Indian Agricultural Research Institute, New Delhi for providing the research facilities and Dr. YSR Horticultural University, Andhra Pradesh for grant of deputation to the first author to carrying out this research work. KRK: He is responsible for conducting all the tissue culture related experiments and analysing the ploidy levels of anther induced regenerants. KPS: He has planned the experiments and provided the basic research facility for conducting these experiments. RB: She has planned the experiments and assisted in conducting the ploidy analysis of anther induced regenerants. DVSR: He has assisted in planning and data analysis of this study. SP: She has contributed in raising the marigold cultivars and maintenance of anther induced regenerants. The consent of all the authors for submission of this manuscript has been taken. There is no conflict of interest among the authors of this manuscript.